Shallots add a hint of sweetness to the fresh goat cheese flavor balanced by the chives' herbaceous notes. Perfect for any cheeseboards, sandwiches, wraps, bagels, and more. Laura Chenel began farming goats in Sonoma County in the 1970's. In 1979, she went to France to learn from master cheesemakers. When returned, she began producing and selling her first cheeses. One of her first customers was Chef Alice Waters, owner of Chez Panisse restaurant in Berkley, CA. Alice Waters fell in love with Laura's cheeses and placed a standing order of 50 pounds per week. 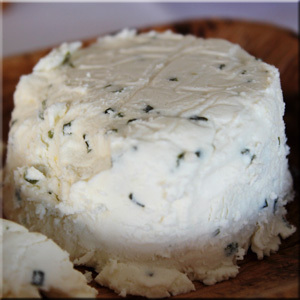 Laura Chenel chevre was the inspiration for the iconic "California Goat Cheese Salad." The rest is history.